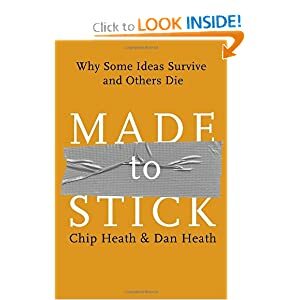 Made to Stick: Why Some Ideas Survive and Others Die by Chip and Dan Heath presents a theory on why some ideas are memorable but others are not. For example, you may quickly be able to recall the details of an urban legend (such as a story about someone seduced then having a kidney stolen or getting shot if you flash your lights at an oncoming car with its lights off) but you may have difficulty recalling the data from the last staff meeting. The authors define six variables to help ideas become "stickier." Keep ideas simple by focusing on the core message. Revealing something unexpected will differentiate your message from others. If your idea or message can be presented in a concrete, tangible way the recipients or audience are more likely to quickly grasp it. Establish credibility by inviting your audience to apply an idea or try a product - test it out for themselves. Creating an emotional connection allows a message to resonate at a deeper levels. Finally, by using stories your message can be easily recalled and shared with others. Applying these principles will help you avoid "the Curse of Knowledge," that is, when you assume people know what you know but they really don't. By applying these concepts when developing and sharing ideas you will enhance the likelihood that you will be better understood and remembered.